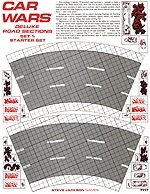 Deluxe Road Sections Set 1: Starter Set contains 12 assorted road sections – four regular curve sections, four tight curve sections, and four straight sections – enough to build a complete Car Wars track. Each sheet has a clean highway version and a debris-littered version – take your pick! 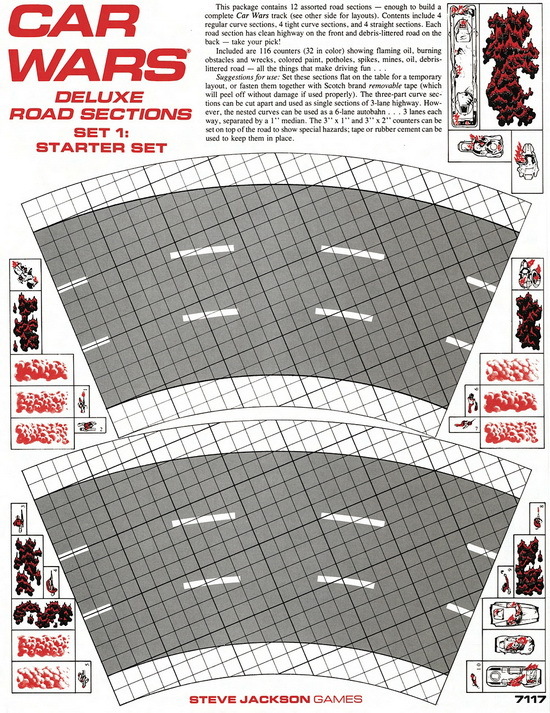 Along with layout suggestions for your track, you also get 116 counters (32 in color) showing flaming oil, burning obstacles and wrecks, colored paint, potholes, spikes, mines, oil, debris-littered road – all the things that make driving fun . . .